The built-in flash has a GN (guide number) of about 8 meters in maximum setting and can sync up to 1/2000 of a second. The GN drops to 5 meters at medium setting and 1.7 meters at minimum setting. External Canon Speedlite flashes can sync at up to 1/250 of a second in normal mode and, with much reduced energy, at up to 1/4000 of a second in high-speed sync mode. External flashes that don’t use the Canon-specific pins (e.g., other-brand flashes or Canon flashes used with these pins electrically isolated) can sync at up to 1/4000 of a second, albeit probably with some loss of energy at the very highest speeds. I reached these conclusions by measuring the guide numbers of the built-in flash of the G15 and an external Canon Speedlite 270EX II flash in different modes and at different shutter speeds. With the built-in flash at maximum setting. With the 270EX II attached to the hot shoe at 1/1 setting using normal (first-shutter) sync mode. This sync mode is selected in the “Shutter Sync” item in the “External Flash” menu. With the 270EX II attached to the hot shoe at 1/1 setting using high-speed sync mode. This sync mode is selected in the “Shutter Sync” item in the “External Flash” menu. With the 270EX II attached to the hot shoe, but with the four Canon-specific contacts on the hot shoe covered with insulating tape, as shown in the following image. Let’s call this “dumb mode”. The photograph on the left shows the G15 hot shoe ready for normal or high-speed sync mode. 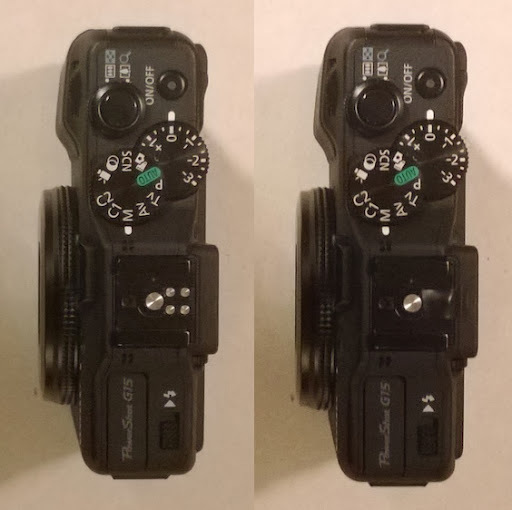 The photograph on the right shows the G15 hot shoe ready for dumb mode, with the four Canon-specific contacts covered with insulating tape. The 270EX II was extended to the “tele” position and aimed directly at the wall in front of the camera (i.e., not bounced). In the exposure with the 270EX II, I had to use the nominal 3-stop ND filter. I calibrated this by comparing images at 1/16 setting with and without the ND filter, and determined that it was equivalent to 2.87 stops. I measured the mean signal level in the green channels in each image, subtracted the mean signal level in the green channel in an ambient light exposure, and for the images taken with the 270EX II adjusted the signal level to compensate for the ND filter. The 270EX II is specified to have a GN of 27 meters when used in normal mode at 50 mm effective focal length. I used this to scale the signal level in each case to a GN. If you prefer to think in stops rather than GN, remember that a factor of two in GN corresponds to two stops. The GN as a function of flash, sync mode, and shutter speed is shown in the following plot. I interpret these results as follows. The internal flash has an almost constant GN of about 8 meters, right out to the maximum speed allowed by the camera of 1/2000 of a second. This is about 3.5 stops fainter than the external 270EX II in normal mode. Although the camera is capable of speeds up to 1/4000 of a second (at least at f/6.3 or slower), when the built-in flash is used it does not allow speeds faster than 1/2000 of a second. There is a suggestion that at 1/2000 of a second the flash performance drops by about 1/10 of a stop (about 7%), which would imply a t.1 time of better than 1/2000 of a second. The camera manual states that flash range in wide angle (28 mm) is 7 meters. When the flash is in automatic mode, it typically selects ISO 320. The maximum range would correspond to the widest aperture of f/1.8. A GN of 8 meters with this ISO speed and aperture would give a nominal range of 8 meters, in close agreement with the manual. I also took images with the built-in flash set to the maximum, medium, and minimum level. These coarse levels are the only control that the camera provides over the flash energy in manual mode. They correspond to GN of about 8, 5, and 1.6 meters. The external 270EX II flash works only up to 1/250 of a second in normal mode. This limitation would be expected for a camera with a standard curtain shutter, which can only simultaneously expose the whole detector at speeds of 1/250 of a second or slower. Nevertheless, it is difficult to understand for a camera such as the G15 with a leaf or electronic shutter capable of simultaneously exposing the complete detector even at the fastest speeds of 1/4000 of a second. We will return to this later. The external 270EX II flash can work at shutters speeds speeds of up to 1/4000 of a second provided the camera selects high-speed sync mode. In this mode, the flash emits a rapid series of lower-energy pulses, and as a result produces a flash whose energy depends on the shutter speed. The 270EX II is specified to produce a GN of 13.5 meters at 1/250 of a second in high-speed sync mode. My measurements suggest it actually performs slightly better, achieving 13.6 meters at 1/320 second. This is about half of the GN in normal flash mode, which corresponds to a drop of about two stops. My measurements also confirm the linear drop in flash energy with shutter speed. This translates to the GN dropping as the square root of the shutter speed, so speeds of 1/500, 1/1000, 1/2000, and 1/4000 of a second have GN of 10.8, 7.6, 5.4, and 3.8 meters. Note in particular that at shutter speeds of 1/1000 of a second or faster the 270EX II is fainter than the built-in flash. The external 270EX II flash in dumb mode (with the Canon-specific pins on the hot-shoe covered with insulating tape) works to 1/4000 of a second. In dumb mode, the camera doesn’t know that an external flash is attached (e.g., it does not show the “External Flash” menu). However, it still shorts the standard central pin to the trigger the flash. For reasons I do not understand, the brightness of the flash is reduced from a GN of about 27 meters for 1/1 in normal mode to about 21 meters, a drop of about 0.7 stops. The GN is more or less constant down to quite fast speeds. At 1/1000 the flash energy has dropped by about 10% and at 1/4000 is has dropped by about 50%. 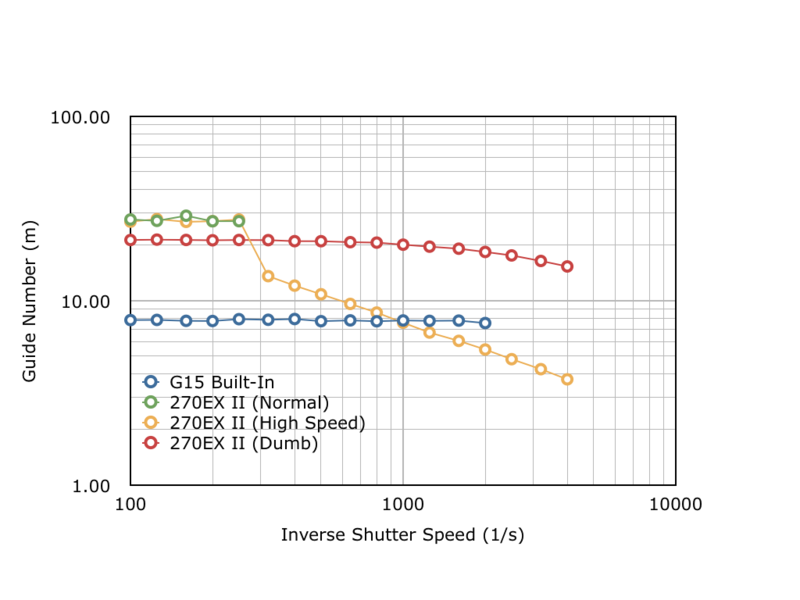 This suggests that the t.1 and t.5 times of the 270EX II are about 1/1000 and 1/4000 of a second. These data show that the G15 is quite capable of syncing to a flash well beyond 1/250 of a second. This confirms that there seems to be no technical reason to have limited the flash in normal mode to 1/250 of a second or slower. This restriction seems either to be an oversight or, perhaps, a deliberate reduction in capability for marketing reasons. I’m inclined to believe it’s an oversight, since fast sync is not a feature that is present on Canon’s more expensive DSLR cameras. Or perhaps Canon really want us to buy Fujis? Unfortunately, since the camera does not recognise the flash and since the 270EX II does not have manual controls beyond on/slave/off, there is no way to tune the exposure other than by adjusting the distance, the aperture, and the ISO. That doesn’t sound like a lot of fun. I would imagine that other Canon Speedlites would perform similarly to the 270EX II, albeit with appropriately scaled GNs. For example, the top-of-the-line US$600 600EX-RT is specified to have a GN of 60 meters in normal mode and 31.8 meters in high-speed sync mode at 1/250 of a second. Both of these numbers are about two stops brighter than the 270EX II. The more expensive Canon Speedlite 320EX, 430EX II, 580EX II, and 600EX-RT external flashes do have manual controls to tune the flash setting, and would be much more practical in dumb mode. I would imagine that non-Canon flashes would perform similarly to the Canon flashes in dumb mode. Most also provide manual control over the flash setting. If you’re interested in using an external flash at high speeds, this is probably the route to take. David Hobby and Zach Arias recommend the US$200 LumoPro LP180. If you’re interested in confirming or extending these results, and don’t want to have to determine the mean signal levels, you can simply see what sort of aperture or ISO adjustment you need to give similarly exposed images under different conditions. Each change in GN by a factor of two corresponds to two stops. So, for example, a normal sync exposure with the external flash at f/8 and a high-speed sync exposure at f/2 and 1/1000 of a second should give similar exposures, provided the flash setting and ISO are equal. Thanks to Rodney Bartlett for helping me understand how to get the G15 to work in high-speed sync mode.